Typical Tasmanian spring weather today. Hot sun, drizzle, cold breezes, solid rain, more hot sun. Snow forecast for Monday I think. 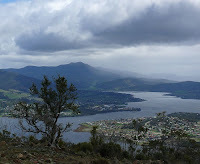 Went for a jaunt up Mt Direction, for the nice views, reasonable exercise and likelihood of minimal rain. Went well. The rain held off mainly, just a bit of drizzle here and there, but cold breezes at the top. Then I was in full sun on the descent, wondering where my sunhat was. Interestingly, on the descent in the middle of the day, there were wallabies in various places along the track. A couple were sitting beside the track quietly, and were placid enough to wait while I composed a photo. These are the Bennett's Wallaby, known elsewhere as the Red-Necked Wallaby, Macropus rufogriseus. Terrific view up the valley.